As a news subscriber to Blue Springs EDC you are receiving our news alert news about the Missouri Innovation Park (MIP). During the past several months the Blue Springs EDC, City of Blue Springs and the University of Missouri (MU) have been working to deliver concrete next steps to advance the Missouri Innovation Park and MU's Mizzou Center. In November an updated "Letter of Agreement" was signed by MU Chancellor Brady Deaton, City of Blue Springs Mayor Carson Ross, Blue Springs EDC Chairman Lyle Shaver, and President Brien Starner, which spelled out specific next steps, responsibilities and timetables to move the MIP and Mizzou Center project forward. To this end the City acquired 3.5 acres recently and is in contract to close on additional land to enable 24 acres at any time that will be developed as the first Phase of the Missouri Innovation Park, covering 63 acres in Phase I. The City is the primary investor in the Missouri Innovation Park and is issuing today an RFQseeking a development/design team to respond by January 20th to our proposal to build a 50-80,000 square foot building to house the University of Missouri for their Mizzou Center growth plans within the MIP. Additional space within the building is intended to support those companies whose growth and research would benefit from the collaboration between MIP and MU's research and development oriented opportunities. We are also hopeful our current Economic Development Administration grant will establish the "business case" for business incubator/business accelerator space in the same building by 2014, for our study planned to get underway soon. Stay tuned for more news on Blue Springs, the EDC and Missouri Innovation Park in coming weeks and months. Read the complete RFQ here. Treat yourself to performances by one of America's finest recognized professional male vocal ensembles, Cantus and hometown favorite, The Kansas City Metro Men's Chorus. The concert is part of the Dome & Spire Series hosted at the world-renowned Community of Christ Temple, featuring one of North America's only Casavant organs. Attend Blue Springs Martin Luther King Day Celebration! 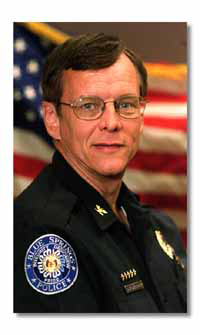 Blue Springs Police Chief Wayne McCoy announced today that assessors from the Commission of Accreditation for Law Enforcement Agencies, Inc. (CALEA) will conduct a public hearing on February 7, 2012 at 5:30 p.m. at the Central Jackson County Fire District’s Training Facility, 4715 W. Highway 40. Blue Springs Mo. Public comments will be taken as part of the Blue Springs Police Department’s process to gain national accreditation. Chief Daniel Boring, ret., Virginia Police Department and Lieutenant Thomas Wilkes, Aurora, Colorado Police Department will conduct the on-site assessment. The accreditation program requires agencies to comply with state-of-the-art standards in four basic areas: policy and procedures, administration, operations, and support services. The assessor will review documentation, interview individuals, and visit areas where compliance with CALEA standards can be observed. As part of the on-site assessment, agency members and the public are invited to offer comments to the assessors by calling (816) 228-0174 on February 7, 2012 from 2-4 p.m. Telephone comments are limited to 10 minutes and must address the agency’s ability to comply with CALEA standards. Copies of the standards are available for review at the Blue Springs Police Department at 1100 SW Smith Street, Blue Springs, Mo. You may also Contact Sergeant Linda DeMo at (816) 220-4567. 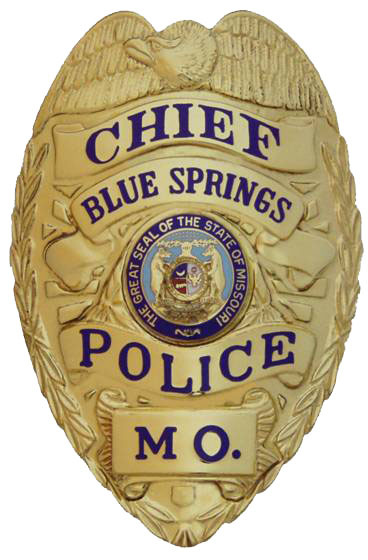 Anyone wishing to submit written comments about the Blue Springs Missouri Police Department’s ability to comply with the standards for accreditation may send them to the Commission on Accreditation for Law Enforcement Agencies, Inc. (CALEA), 13575 Heathcote Blvd., Gainesville, Va. 20155. 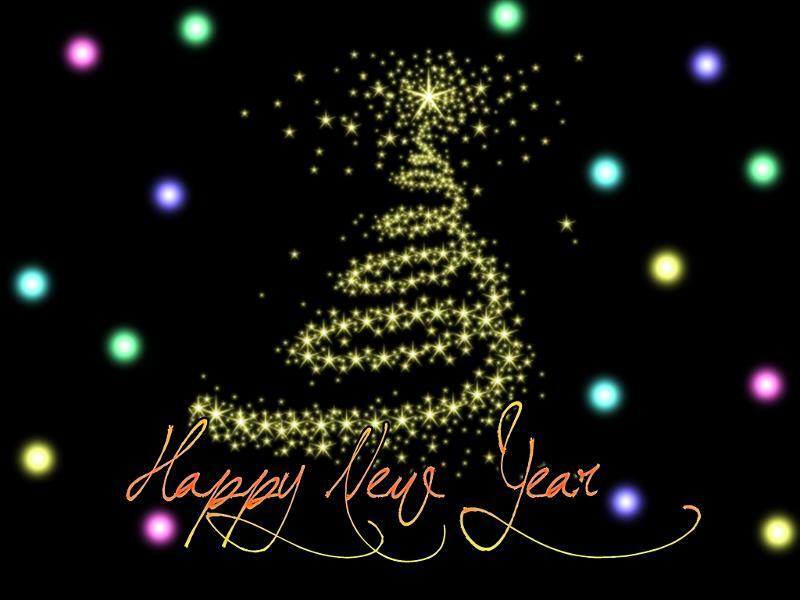 The staff at Parks & Recreation wishes you a very Happpy New Year. We look forward to working with you to take advantage of the opportunities and to meet the challenges ahead. JUST OUT: The 2012 winter/spring issue of the Parks & Recreation of Blue Springs activity guide is now available. The 23 page activity guide has been mailed to every Blue Springs resident along with the City's Blue Springs Magazine. All 50-Plus activities and programs occurring at Vesper Hall Community Center are also included in the Parks & Recreation activity guide. 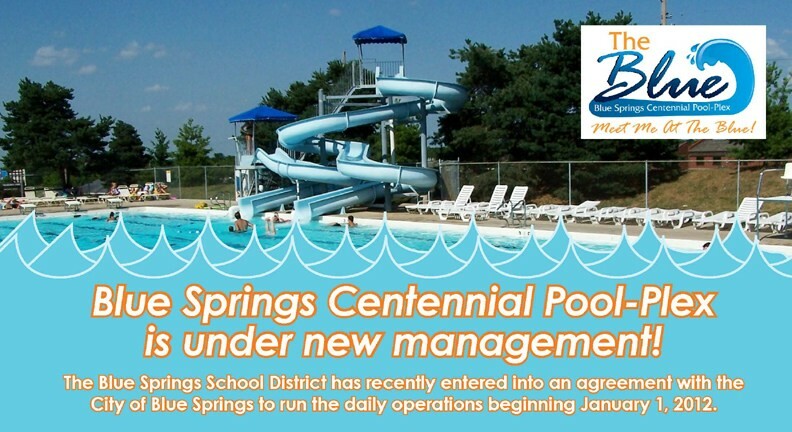 Beginning January 1, 2012 daily operations of the Centennial Pool-Plex will be managed by the Blue Springs School District. Bill Shalley is the new pool manager and has a long time affiliation with the Pool-Plex. 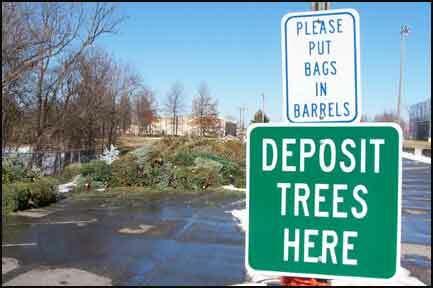 Drop off your Christmas tree after the holidays at the designated area in Pink Hill Park's west parking lot. Only trees with tinsel and ornaments removed will be accepted. Don't throw away all those Christmas boxes, recycle them. The recycling center is open on Saturdays, Sundays and Wednesdays from 8 a.m. to 4 p.m. to accept your cardboard boxes and other recyclables. Get fit in the New Year during our Fitness and Wellness Week at Vesper Hall Community Center! All new visitors, ages 50 and over, can exercise for free. New participants will receive free weight room passes that are good for the week of January 9th through January 13th. 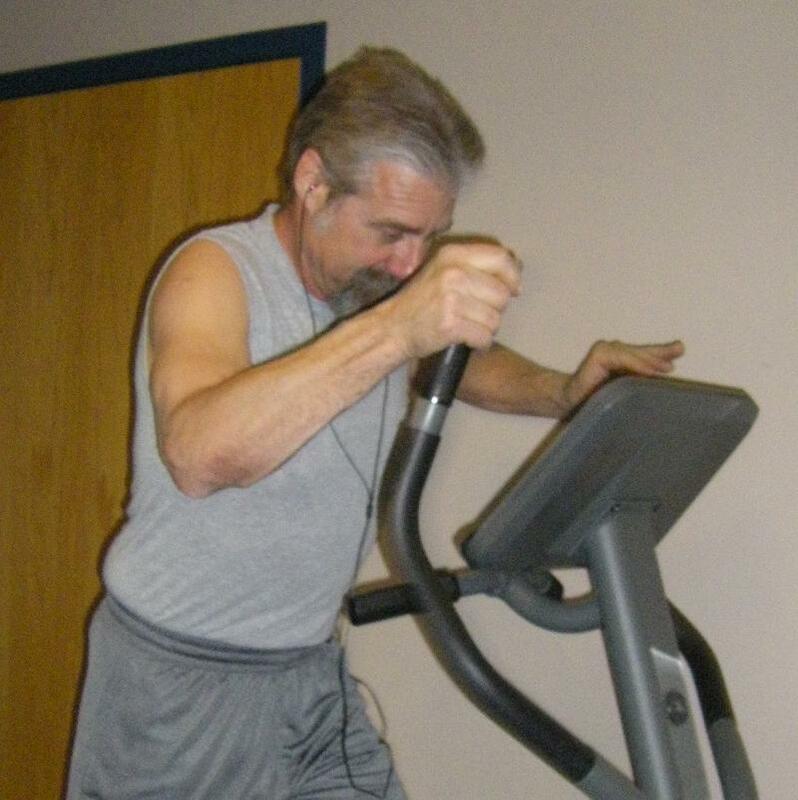 Try the elliptical rider, the dual use strength machine, bicycles, treadmills, and/or free weights. 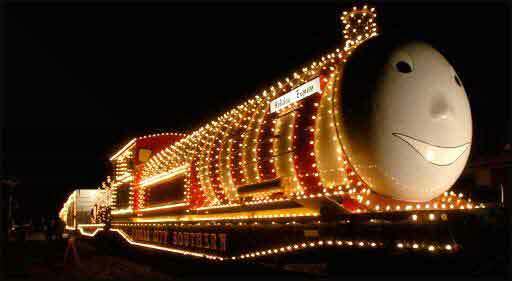 A regular month pass is $15.00, a regular day pass is $3.00 and a year pass is $120.00. Try it all for free this one week! Free exercise classes are available with a canned food donation during Fitness and Wellness Week. Check out any drop-in exercise class in exchange for a can of food per class. All donations benefit the Midwest Foster Care Food Pantry. Classes include, Crosstrainer Aerobics, Stretching Exercise, Tai Chi, Yoga for Beginners and Beyond, as well as Wii Sports. Call Vesper Hall at 228-0181 for class dates and times. Available during regular business hours: Monday, Tuesday and Thursday 8 am - 9 pm, Wednesday and Friday, 8 am - 5 pm. R.U.F.F. 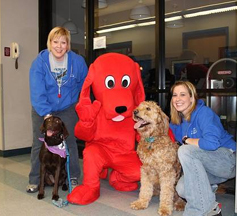 (Responsible Unleashed Fun for Fido) Blue Springs is holding a Chili Dog Dinner and Silent Auction on Saturday, January 21st from 5:30 - 7:00 pm at Vesper Hall, 400 NW Vesper Street. Come and feast on chili dogs with assorted toppings, desserts, and beverages. 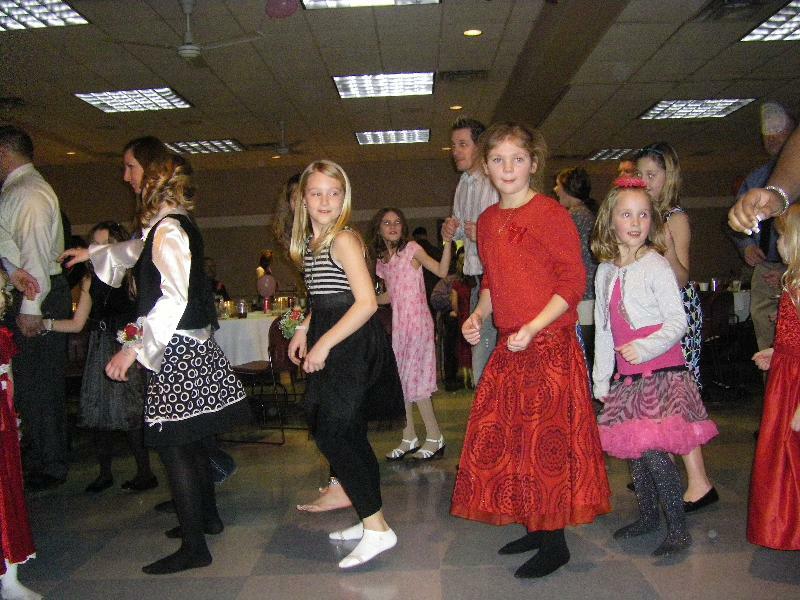 This will be lots of fun for the whole family with a live Deejay and entertainment included. Other activities include a silent auction, door prizes, raffle drawings, and a demonstration by the Missouri Search & Rescue K-9 Unit. All proceeds benefit the Blue Springs off-leash dog park located in Gregory O. Grounds Park. Cost is $6.00 per adult and $4.00 per child 12 years of age and under. Children 3 years and under are free. You can pre-register with Blue Springs Parks & Recreation, City Hall, 903 W Main Street, Blue Springs, MO 64015. Call the Parks & Recreation Offices at 228-0238 for additional information. The Blue Springs Parks & Recreation Department will be sponsoring the 20th Annual Youth Sports and Recreation Expo, Saturday, January 28th, 9:00 am - 1:00 pm. This event will be held at Adams Pointe Conference Center, 1400 NE Coronado Drive. The Expo is a great opportunity for kids, parents, coaches and area residents to register for spring and summer programs. Some of the participating programs are baseball, softball, football, basketball, BMX, martial arts, gymnastics, fencing and there are a variety of activities and resources to learn about. It also gives everyone involved with sports and recreation a chance to meet with the various representatives. 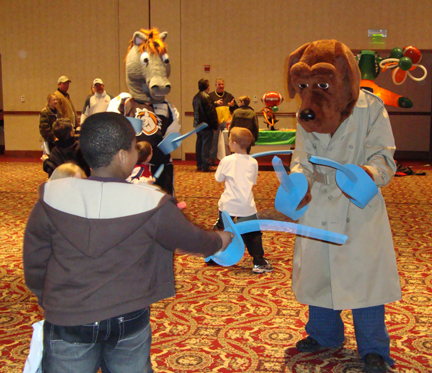 One of the biggest attractions is the appearance of T-Bones Mascot Sizzle and Chiefs KC Wolf. We hope to see your family and friends out at Adams Pointe Conference Center enjoying this time saving and informative family event. Don't miss this opportunity to see new products and to meet with the representatives of the various youth athletic organizations. 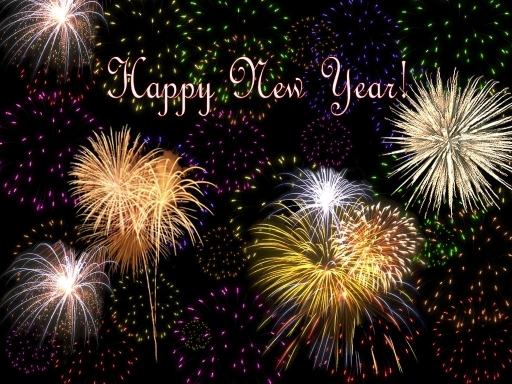 MAKE 2012 THE SAFEST YEAR EVER IN BLUE SPRINGS! 10th BSPD Citizen Academy Class Graduates! BSPD Prepares for Accreditation On-site to be held February 6-9, 2012. Everyone is welcome to provide input through the Public Hearing or call-in sessions on February 7, 2012. 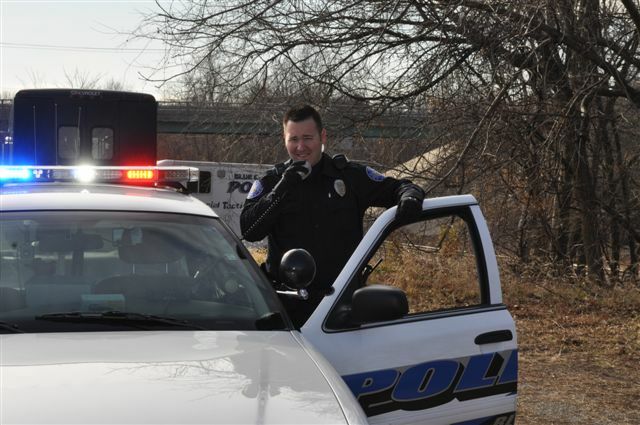 Through the Commission on Accreditation for Law Enforcement Agencies, Inc. (CALEA), the Blue Springs Police Department voluntarily strives to achieve elite status by complying with national standards. On February 6-9, 2012, assessors from CALEA will be examining BSPD policies, procedures and processes to ensure that we meet national standards. The assessors from CALEA will be Chief Daniel Boring, ret. from the Culpepper, Virginia Police Department and Lieutenant Thomas Wilkes of the Aurora, Colorado Police Department. As part of the process, the assessors conduct a public hearing and a public call-in session to obtain input. Interested citizens can call the assessors on Tuesday, February 7, 2012 between 2:00 p.m. and 4:00 p.m. at 816 228-0174, or attend a public hearing in person at the Central Jackson County Fire Protection District Training Center on 40 Highway at 5:30 p.m. the same date. Uniformed Police Officer Kenneth Keating was a recent Employee of the Month. Uniformed Officers on the street are your first responders in an emergency. 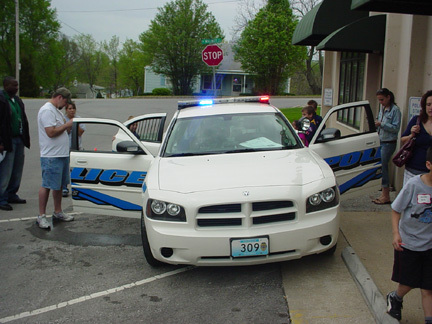 Group tours of the Blue Springs Police Department are offered to students and youth. Call the Crime Prevention Unit at (816) 228-0178 to arrange a tour for your group. "Mission Possible." O ur goal as always is to provide you with the most up-to-date information related to organizational activities and progress. With the new year comes the potential for dangerous roadways due to ice and snow. Be sure to allow time to clear windows thoroughly, and never leave your vehicle running and unlocked. Don't tempt someone into becoming a car thief! In this issue we'll feature information on the upcoming accreditation process and public hearing, our 10th Citizen Academy class, 2011 Awards Event and feature another of our outstanding employees. Join our BSPD Facebook Page! Citizens Honored at the 2011 BSPD Awards Ceremony. The 10h annual awards ceremony of the Blue Springs Police Department, attended by approximately 150 employees, friends, family, city officials and community members was held on Sunday, December 11th, 2011, filling Adams Pointe Golf Club, where the staff at Adams Pointe provided a warm and festive atmosphere in which to celebrate. Chief McCoy presented Citizen Recognition Certificates to Glen Williams and Wade Williams, two residents that assisted the police department with the apprehension of a suspect in a bank robbery on May 17, 2011. Missouri State Representatives Sheila Solon and Jeanie Lauer were on hand to present House resolutions to the four "of the Year" recipients, including Volunteer of the Year Donn Wyckoff, Civilian Employee of the Year Teri Sandlin, Officer of the Year Shannon Humphrey and Supervisor of the Year Stacey Edwards. A civic minded group of citizens have given of their time and talents to participate in the Blue Springs Police Department's Citizen Police Academy (CPA). On November 2, 2011, the 10th class culminated with graduation at the Howard L. Brown Public Safety Building. The CPA is a program designed to involve citizens with the Police Department and give them an opportunity to learn about police work and allow officers and citizens to interact and get to know each other. The first class began in September, 2008; since then over 180 people have participated in the 10 classes. Class 10 brought together 19 individuals from diverse backgrounds with a desire to learn what police work is really all about. And learn they did! 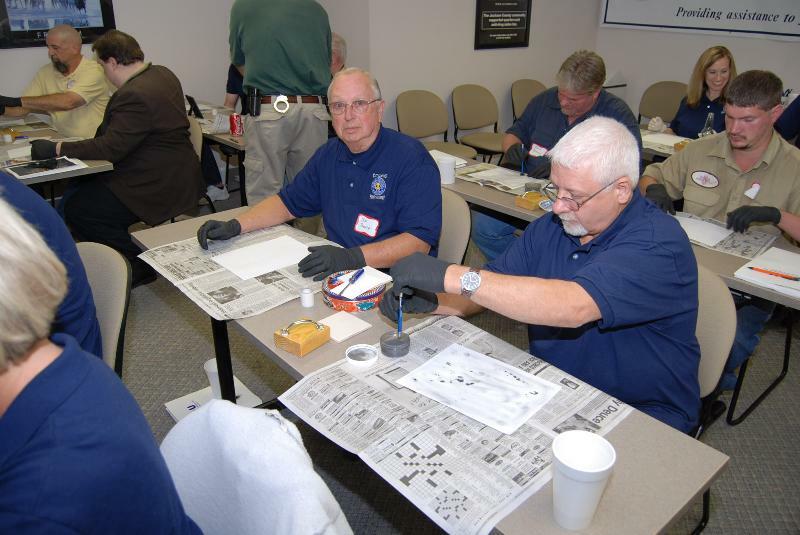 The overall experience has been overwhelmingly positive for the participants of the class and many have become enthusiastic supporters of the police department, continuing their participation after the class ends through the Citizen Police Academy Alumni Association or by becoming a department volunteer. Soon to follow is the 11th class, which begins on January 26, 2012. The program has been so popular that BSPD has added more classes than originally scheduled, but a waiting list of hopeful attendees remains. 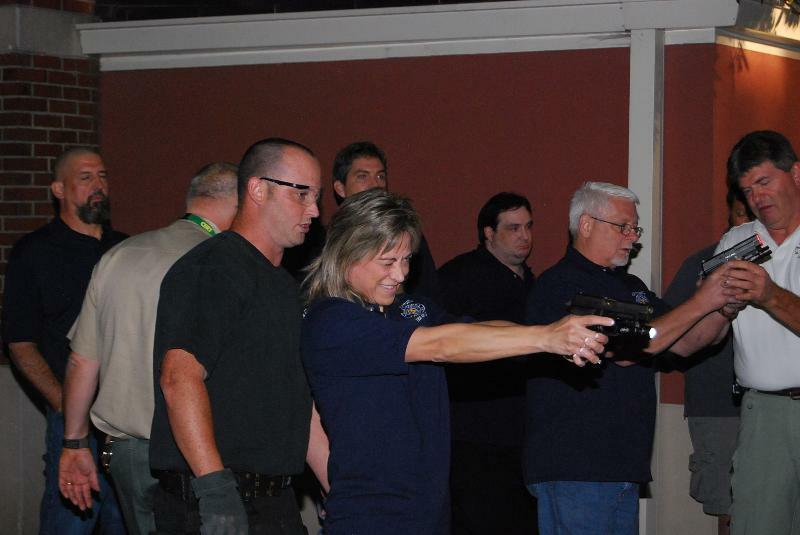 The Blue Springs Citizen and Youth Police Academies are ongoing programs. Information can be obtained by contacting Sergeant Allen Kintz or Officer Doug Heishman 816-228-0178, or on the Internet at www.bluespringsgov.com. Is has been my pleasure to bring you the latest news in Blue Springs public safety. The Blue Springs Police Department is thankful for the tremendous support shown by our citizens. Did you enjoy this issue of Mission Possible? Be sure to send me your feedback on how we can continue to improve this publication.